When I am writing this post, thousands of electrical signals are transmitted by nerve cells and all these at a lightning speed and and my brain conveys instruction to my fingers and my fingers just following the instruction. But out of ignorance, I am always after wonders and blunders of the world not knowing that I am the greatest wonder ever and not even getting a chance to appreciate that. 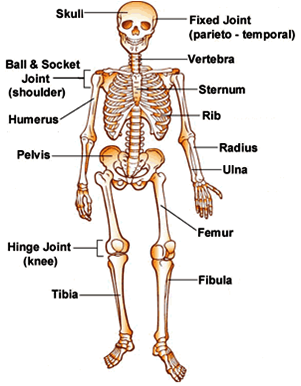 Human body is a complex machine, made up of different systems. Why this post? I have encountered many questions from this topic in different exams. I think this post will definitely help you in getting maximum information on this topic in less time. Don't forget to appreciate this amazing machine. 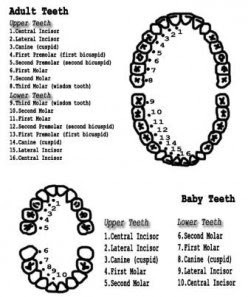 Teeth: Humans dentition is described as thecodont, heterodont and diphyodont. Diphyodont: Teeth appear twice in the life time of human. They are milk teeth and permanent teeth. An adult human being has 16 teeth on each jaw. In each half of jaws starting from the middle and going backwards, there are two incisors, one canine, two premolars and three molars (2+1+2+3). 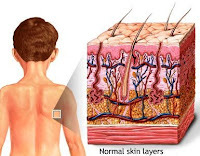 The Integumentary system, consisting of the skin, hair and nails, acts as barrier to protect the body from the outside world.It also functions to retain body fluids, protect against disease, eliminates waste products, and regulate body temperature. Skin is the largest organ in the body. Healthy skin has a mean pH of 5.5. This natural acidity is responsible for maintaining the skin's natural flora and protecting against bacterial or fungal colonization. Structurally, skin consists of two layers: Epidermis and dermis. 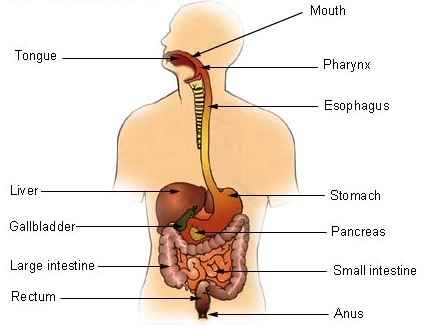 Digestive system is well developed and consists of alimentary canal and associated glands. Largest gland, weighs about 1.5 kg in man. It is about 1/40th of the total body weight. Oxygen is necessary for the oxidation of nutrients. Body gets oxygen through respiratory gas exchange. The process by which oxidation of nutrients take place in the living cell is known as respiration.It is the step by step oxidation of food materials to release energy for biological work. 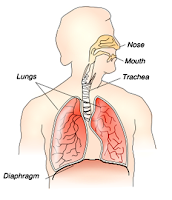 The organs used for breathing, the pharynx, larynx, trachea, bronchi,lungs and diaphragm. The lung is the essential respiration organ in higher vertebrates (man). The organ without muscle is lungs. The main function of the lungs is the oxygenation of blood and to supply oxygen to it. Vital capacity (VC): 5.6 L (Male), 5 L (Female). Tidal volume (VT) at rest: 0.6 L (Male), 0.5 L (Female). Inspiratory reserve volume: 3.2 L (Male), 2.9 L (Female). Expiratory reserve volume: 1.8 L (Male), 1.6 L (Female). Residual volume: 1.4 L (Male), 1.2 L (Female). Max. breathing capacity in 30 breaths/min: 110 L (Male), 100 L (Female). RBC: (Red blood cell or erythrocyte)- blood cell containing the pigment hemoglobin , the principal function of which it the transport of oxygen. 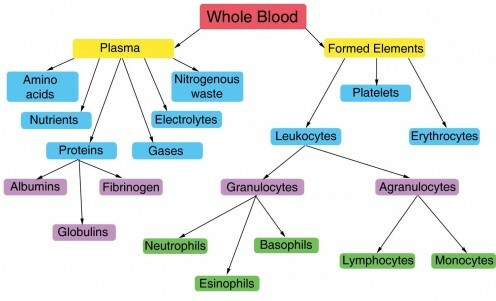 WBC (White Blood Corpuscles or Lekocytes) which are involved in protecting the body against foreign substances and in antibody production. 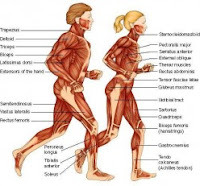 Muscles, the organs of the muscular system are the specialised cells which are responsible for the movement and locomotion. They are characterized by properties such as excitability, contractility, extensibility and elasticity. 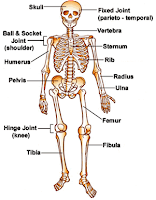 The human skeletal system consists of bones and cartilages of various types. 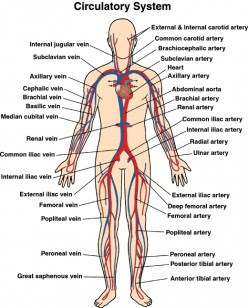 They provide support, surface for the attachment of muscles and protection to many vital organs like brain, heart, eyes etc, also give a definite form and shape to the body. In an infant, there are 33 vertebrae in the vertebral column. Five of these bones eventually fuse to form the sacrum, and four other join to become the coccyx. As a result, an adult vertebral column has 26 vertebrae. Nervous system consists of central nervous system ( includes brain and spinal cord), peripheral nervous system ( includes cranial nerves and spinal nerves) and autonomic nervous system( Nerve chains on either sides of the vertebral column). The brain and spinal cord constitute the central nervous system (CNS). The brain is the largest and the most complex part of the nervous system. The brain is enclosed in the cranium and the spinal cord in the vertebral column. 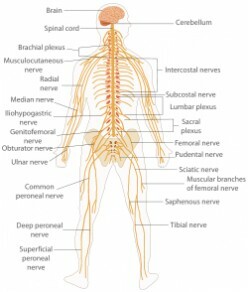 The peripheral nervous system(PNS) consists of the nerves that arise from the central nervous system and connect it to various body parts.The PNS includes cranial nerves and spinal nerves. There are12 pairs of cranial nerves and 31 pairs of spinal nerves. The cranial nerves (12) include sensory (3), motor (5) and mixed (4) nerves. The spinal nerves are named according to the level from they arise. There are 8 pairs of cranial nerves, 12 pairs of thoracic nerves, 5 pairs of lumbar nerves, 5 pairs sacral nerves and a pair of coccygeal nerve. Endocrine system are those systems which generally control long term activities of target organs as well as physiological process such as digestion, metabolism, growth, development and reproduction in contrast to more rapid activities under the control of nervous system either directly or indirectly. The endocrine system carries out a wide variety of physiological process through chemical messengers called "hormones". The organs and tissues participating in the removal of waste products constitute the excretory system. It includes mainly the urinary system. The urinary system is concerned with the production, storage and elimination of urine. In addition to the urinary system some other organs such as liver, lungs and skin also function as excretory organs. These organs are called accessory excretory organs. 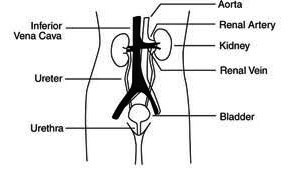 The two kidneys are not in same level. The right kidney is slightly lower the left kidney, because the right side of the abdominal cavity is occupied by the liver. 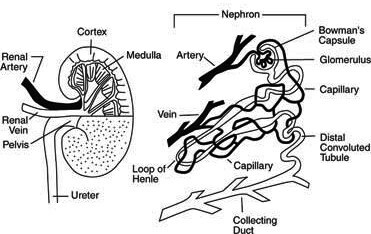 Nephrons : The structural and functional units of kidneys. A cross section of the kidney (left) and Nephron (right). The volume of urine formed in 24 hours in 1-1.8 litres. It is a collection of mechanism within an organism that protects aginst diseases by identifying and kiiling pathogens and tumor cells. It detects a wide variety of agents from viruses to parasitic worms, and needs to distinguish them from the organism’s own healthy cells and tissues in order to function properly.The immune system of vertebraes such as human consists of many types of proteins (immunoglobulins), cells, ogans and tissues, which interact in an elaborate and dynamic network . 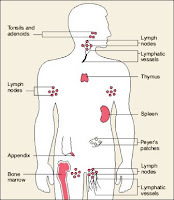 Thymus is the site of T lymphocyte maturation and bone marrow is the site of B lymphocytes maturation and are responsible for cellular and humoral immune response respectively. 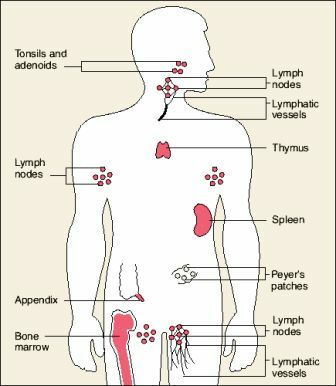 Secondary Lymphoid organs(Peripheral Lymphoid organs) : Lymphnodes, spleen, tonsils, Peyer's patches of the small intestine, appendix and mucousal associated lymphoid tissue (MALT).